The County Convention took place in Nowlan Park on Tuesday night last. It was going to be the end of an Era for Former Chairman Martin Quilty who after 5 years had to step-down. In his heartfelt and emotional speech he recalled the activities of the past 12 months. He spoke of the heartache for Thomastown and Young Irelands in the Leinster Club Finals on 18th November which were held in Nowlan Park. He congratulated the Senior team on their League and Leinster success and said it was gut wrenching to loose to Cork in the All Ireland Final. He praised the work of Ann Downey and her backroom team for all their work and he wished Paddy Mullally the very best in his new job as Mullinavat Senior Hurling Manager. He also thanked all of the Managers who trained adult and juvenile teams during 2018. He had praise for the development squads who were very successful again this year but was concerned that we hadn’t won an Under 16 All Ireland title in 10 years. He was hoping that this would change into the future. He congratulated all the clubs on their success during the year and had a special mention to St Brigids who won the Under 14 and Under 16 Roinn A championships. He thanked all the sponsors who had sponsored gear for the underage teams and also to Tom Britton and Marble City Travel for their sponsorship of the club competitions over the past 2 years. He had a special mention to Brian Phelan and Glanbia who he said gives a substantial financial backing to the County Board and although many asks why they get so much publicity he said he made no apologies about that and said he would continue to do so. He thanked Intosport and especially Jonny Dowling and was very grateful of the sponsorship of all the gear for this years All Ireland Final, he also thanked Pat Foley from Pat Foley Transport for the use of his lorry for the fundraiser g in Thomastown in September and to Fastlane Audio and Ray Brophy for the work he does during events and fundraisers and he said all of the above was greatly appreciated. He thanked the referees who he said had the worst job in the County. He said that all referees were human and they sometimes make mistakes but it wasn’t done deliberately and that they go out to do their best at every game and h said without referees we wouldn’t have games and “That was a matter of Fact”. He thanked the GAA Bard for their help and guidance during his term he paid special tribute to Jimmy Walsh, Conor Deneiffe and Barry Hickey for their support and to Seamus Reade who allowed the Poc Fada be part of a joint run event with the GAA bard this year in Gowran Racecourse. He also thanked KCLR and to CEO John Purcell who had been very good to the Camogie over the past 5 years and said that the coverage of female sports in general had increased greatly recently and he was delighted with the coverage that Camogie got. He also thanked the many staff in KCLR for their assistance during the year with different events leading up to the All Ireland and for the air time during league and championship games. He thanked John Coogan, Kevin McGarry and Mick O Neill for their help while hosting games in Nowlan Park and he said the GAA was very lucky to have the caliber of the men they had working for the organization and that they went above and beyond the call of duty very often. He thanked all his fellow officers that he had the privileged of working with over the last few years and that he had had wonderful times with them. He thanked the clubs for their support during his term of office and thanked them for putting faith in him by their nominations at convention time. He pointed out that many people thought the chairman’s role was easy but he clearly put the record right “The Chairman’s role is not a dawdle in the Park, you don’t just turn up present a trophy and get a picture taken”. He said hes had many sleepless nights and even got panic attacks during his term but he did enjoy the work and he wanted to see Kilkenny Camogie do well. He said he had made some enemies along the way but he had also made many many friends. He concluded by giving praise to his family for their help and support and said that “Without support from home you cant do the job 100%”. He also thanked his Fiance who had been there for him through good times and bad and that he would have been lost without him. 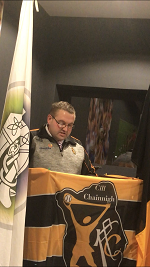 He concluded his emotional speech by wishing everyone well for 2019 and ended his speech with “Kilkenny Camogie Abú”. Secretary Theresa Aylward gave a vert detailed report. She too congratulated all the club and primary schools winners. She listed each winner in her report. She also congratulated our 5 All Star recipients on their fabulous accolade. She thanked Jimmy Walsh and the GAA board, the referees and all the clubs that allowed the Board to use their facilities during 2018. She gave a special mention to two officers Martin and Roseanna who both had to step down from their roles as they had served 5 years. He said “As Chairperson Martin acted above and beyond the call of duty and has been an outstanding support to me and all involved with Kilkenny Camogie”. She welcomed any new incoming officers to the Board and wished everyone the best of luck for 2019. Michael Ryan gave a handed out a very detailed financial statement. During the year from September 2017 to September 2018 he said the expenditure was €85, 935. He said while it was great to have some excess there was still some outstanding bills that needed to be paid but that the Board was in a healthy state of affairs. He said it was his aim to try and put aside some finances to secure some ground so we could have our own facilities. He said that with clubs help this was very achievable over the next 5 years. Martin thanked Michael for his tremendous work on the accounts and congratulated him on having the accounts in excellent shape. Other reports were also read on the night: Kathleen Purcell outlined the fixtures report and said that some tweaking would be needed to ensure fixtures were adhered to for next year. There was a small debate and a lot of the delegates felt that it would be better with families on holidays if the Month of July could be kept free from Camogie Games to allow families to take holidays during this period. Roseanna Doyle gave her last report as Registrar and handed out a report with all the clubs individual registration numbers. A total of 4,878 members were registered in Kilkenny Last year an increase of 257 from 2017. Lillian Holohan gave her Children’s Officer report and stated that everyone in officer jobs were all volunteers and that people needed to realize that. She said there was protocols in place for dealing with breaches of the code and that these take time to investigate. She thanked all the club Children’s Officers for all their help during the year. the remaining reports of Development and PRO were also read on the night. There was a healthy debate and vote during the Motions/Bye Laws. There was 10 motions/bye laws up fr consideration, five of these were ruled out of order and the other 5 were all voted on. 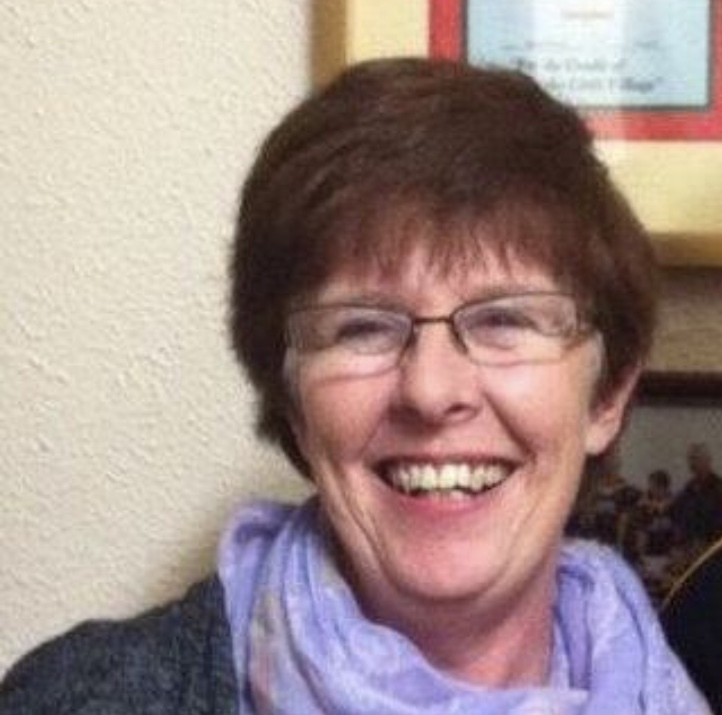 After Sheila was deemed elected by Martin Quilty he vacated the chair for Sheila. Sheila said that Martin has very big shoes to try and fill but she would do her best. She thanked everyone for the wonderful opportunity. The County Convention of 2018 concluded.